Travis Parker is the Planning Director for the City of Lakewood, Colorado. Today he's sharing a guest article about a new website that is helping his community reach more people for public comment on important local issues. A recent Planning Commission public hearing in Lakewood, Colorado proceeded much the same as it does in similar meetings across the country. The applicant for a rezoning presented his case to the Commission members followed by a staff presentation. The Chairman then called for public comment and a few citizens took their turn at the microphone, sharing concerns about the proposal. After about a half hour of discussion among the Commissioners, a vote was taken and the meeting was adjourned. To a casual observer, there was no difference between this meeting and any local government hearing held anywhere else in the country. In fact, one would assume that only the audiovisual equipment differentiated this meeting from similar ones held a century ago. In actuality, this meeting was one of the first of its kind anywhere. It represents what I believe is the future of public hearings. Just as ride sharing apps like Uber have completely altered transportation, technology will undoubtedly have a similar impact on our public hearings. In the case described above, the traditional live public hearing followed a two-week-long public hearing that had taken place online prior to the meeting night. Through our new website, Lakewoodspeaks.org, our mid-size Colorado city is innovating how people participate in their local government’s decision making. The idea behind Lakewoodspeaks.org is an attempt to replicate the live hearing experience online in an effort to remove the time and space constraints of publics hearings conducted in the physical world. The goal is to increase citizen engagement and broaden the demographics of participants. Citizens who visit the website participate much like they would in person, but with more options to educate themselves about the case. The website offers them recorded videos of the staff and applicant presentations, a PDF of the government staff report, various maps, and other materials related to the case. Citizens are able to ask questions of and receive responses from both staff and applicants — all from their mobile phone, tablet, or computer. Citizens can post their public comment for members of the Planning Commission on Lakewoodspeaks.org. 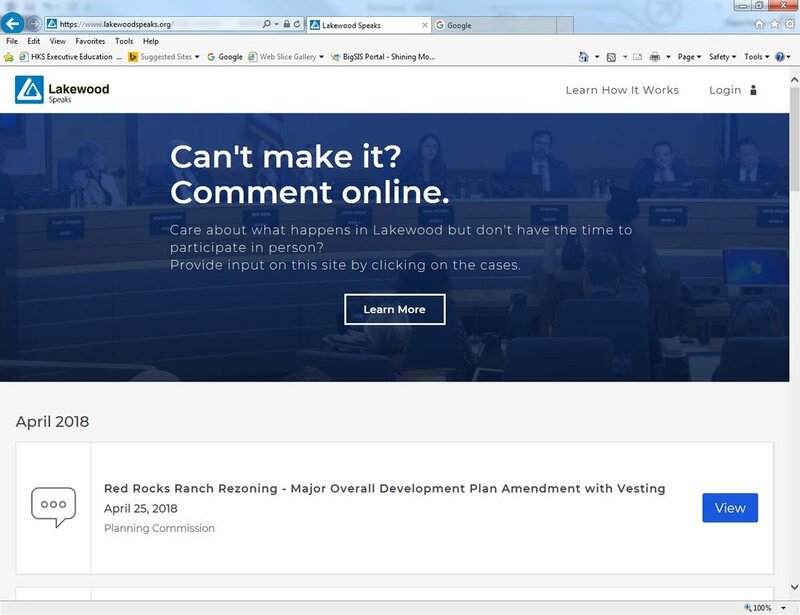 Public comments are displayed publicly on the website, along with a tracker indicating how many Commissioners read each comment, and legally become part of the public record. Through these tools the website provides the same opportunity to share thoughts with the Commission and receive acknowledgement of those thoughts. No longer do our citizens need to attend a weeknight hearing to have a voice in the process. People with children, jobs, commitments, or simply competing priorities can weigh in on issues they care about on their own schedule from their own home. The site is the product of nearly two years of design and testing by the City and our project partner, People Speak. After a fruitless search for existing solutions, we partnered with this software development team to help create the experience we envisioned. The developers worked closely with both Planning staff and government attorneys to ensure that the result met the expectations of the citizens, avoided new work for staff, and surpassed the exacting legal parameters of public hearings. The primary process change was creating video presentations to post on the website two weeks prior to the public hearing. Despite early concerns that this might be difficult (unknown/unproven skills, changing our timelines, etc. ), it turned out to be relatively easy. Both staff and applicants already created presentations for the live hearing and the only changes were in the deadline and the use of audio recording through PowerPoint or other presentation software. Most of our videos are simply screen captures of the presentations with voiceover. We discovered PowerPoint has a feature that allows you to record one slide at a time, so we avoided doing any post-production and we didn’t need to memorize or perfectly deliver presentations. Now when we conduct live presentations, they have already been seen by dozens or hundreds of people. At the live hearing, the Commission has the benefit of having reviewed additional comments prior to the meeting and can ask questions and request changes that result in better decisions and better projects. Lakewoodspeaks.org has now been in full public use in Lakewood for over eight months and results have exceeded expectations. Views of presentations online have been 10 to 15 times the number of in-person attendees. On average, about the same number of public comments have been submitted online as are made in person, though we are seeing a steady rise in online commenting as awareness of the website increases. Reaction has been positive; citizens have expressed appreciation for the new option to participate and the Commissioners themselves love the additional public input. They are seeing a wider variety of participation and appreciate the additional comments that they have received. A pleasant side benefit has been the ability to go paperless; the Commission can now forego traditional paper staff reports and use the website to access public hearing agendas and case information. The recent rezoning case received a positive recommendation from the Planning Commission, but not before they proposed changes and resolved issues that were brought up in the online comments. The applicant was able to respond to and address comments at the meeting and later expressed appreciation for the ability for people to participate in a less rushed and more constructive way. Citizens who commented online and later provided feedback indicated that they appreciated the ability to comment on the case without the cost of a few hours on a busy weeknight. The Future of Public Hearings? Evolving public hearings to better serve our citizens seems like an obvious idea with little downside. Whether our exact model in Lakewood is the correct solution or not, I believe that we are not far from the day when participation in all public hearings is available online. We’re still early in our tinkering and learning more with each case but we are already showing the potential to greatly strengthen the ties to our community and make our public hearing process more efficient and effective. Our hope is that this makes our city stronger. I’d love to hear what you think the future of public hearings will look like. If your ideas resonate with us, perhaps we’ll test them here in Lakewood. Read the follow-up article assessing the success of this platform: "Public Engagement: The Future in 2 Data Points." Hilton Hotels sacrifices their customers in the name of efficiency. There is a lesson there for your city about the tradeoffs of efficiency. In this episode of our new podcast It’s the Little Things, Jacob Moses chats with Nick Kittle, author of the recently released book Sustainovation: Building Sustainable Innovation in Government, One Wildly Creative Idea at a Time. Nick argues that—even in government—innovation is an attainable workplace culture that, when embraced, can create meaningful change in our cities, towns, and neighborhoods.